Murder by Negligence – a Hard Case Makes Bad Law? The public road is the most basic form of public infrastructure. While it can, in one instance, be easily recognised when it is subject to a formed carriageway, in another instance a road may present as a crude track disappearing aimlessly off into the distance. Or it may not even appear to exist to the eye at all. In each case, its legal status essentially is the same, that status being what distinguishes a public road or, as the common law prefers, a highway, from other ways or private roads: it is a thoroughfare over which the public may pass and repass without interference. At common law, public acceptance of a landowner’s offer to dedicate a highway forever meant that the public had its right of passage, but, also that the public henceforth accepted responsibility for the highway’s maintenance – “once a highway, always a highway” is the adage of the common law. Today, while the common law still plays its part, the dedication of land as a road, the road’s use, including for the operation of public utility infrastructure, and a road’s control and maintenance by a road authority, all are matters largely of statute. This has created complexity and some uncertainty around the meaning of “road”. Part 1 of this three-part article explores the legal nature and creation of a public road in Queensland. Part 2 will consider ownership and control of a road, and the granting of private rights in a road. And finally, Part 3 will look at the public’s right to use a road, the notion of the “road in fact”, and closing a road. While the article does not pretend to be an exhaustive treatment of roads in Queensland, it does, in part, try to articulate how the modern road is at risk of losing the internal consistency and policy that the common law of “highway” gave to the law in this area. 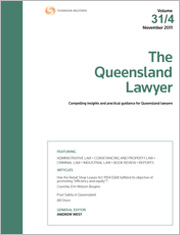 For the PDF version of the table of contents, click here: Qld Lawyer Vol 37 No 1 Contents.